Micro? Macro? Social work education embraces both perspectives, but encouraging interest and involvement in both approaches from students and practicing professionals is an ongoing challenge. Which of the following could be considered a role of a social worker? The answer, of course, is that social workers can play all these roles—and many more. What sets social work apart from many other professions concerned with human well-being is the seemingly unlimited ways its work can be manifested. But maintaining a profession with a plurality of roles can be challenging. Unsure of exactly where they fit in the profession, many social workers seek a label to attach to themselves. They either are a “micro” worker focused on clinical practice or a “macro” worker focused on community organization, nonprofit management, or social reform. Even though the profession encourages social workers to embrace both perspectives, a perception of tension between the two has led to debate throughout the profession’s history. What Is ‘True’ Social Work? In the preface of Harry Specht and Mark Courtney’s book Unfaithful Angels, Specht laments what he sees as social work’s drift away from social justice: “When I first came to know social workers half a century ago, they had a mission that was, to me, appealing and significant: to help poor people, to improve community life, and to solve difficult social problems. But times have changed. Today, a significant proportion of social workers are practicing psychotherapy, and doing so privately, with a primarily middle-class, professional, Caucasian clientele” (p. ix-x). Specht’s concerns are not new; in fact, debate over the role of case and cause in social work stretches back to the profession’s origins in the late 19th century. Much has been written about the differing perspectives of social work pioneers Jane Addams, with her focus on social reform and political action, and Mary Richmond, with her focus on individual casework. Although one perspective has never eclipsed the other, the influence of each one has waxed and waned depending on societal, cultural, and political changes. For example, progressive reform took a beating during the age of McCarthyism in the 1950s only to reemerge in the tumult of the late 1960s and again retreat during the conservative leadership of President Ronald Reagan during the 1980s (Abramovitz, 1998). Caught in the middle of this struggle has been social work education, saddled with the difficult task of preserving social work’s focus on multiple modalities while ensuring that students master certain core competencies needed for professional work. Fifty years ago, Charlotte Towle, writing in Social Service Review, described this challenge: “Gradually, we have come to the point of view that, while the demands of professional education cannot be individualized, the student can and must be individualized throughout the educational process” (p. 398). Social Work Education: Divided or United? Despite the historical debate about social work’s role as a case or cause profession, it is clear that the majority of students entering educational programs today want to pursue careers as clinicians. The popularity of clinical work may have more to do with practical matters than any conscious decision to reject social activism. For example, some students believe they will not be able to pass state licensing exams unless they take classes focused on service to individuals and families. Another concern is the earning potential to be had in a clinical career vs. one focused on macro-level service. The predominance of clinical work also is reflected in the method concentrations offered by master’s programs nationwide. The Council on Social Work Education (CSWE) found in a 2010 survey that the direct practice/clinical concentration was by far the most common concentration—56% of programs offered this concentration vs. 16% offering a community planning/organization concentration, 16% offering a management/administration concentration, 5% offering a social policy concentration, and 4% offering a program evaluation concentration. Nearly 21,000 students were enrolled in a direct practice/clinical concentration, while fewer than 1,000 were enrolled in a community planning/organization, management/administration, social policy, or program evaluation concentration. 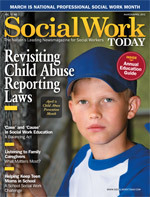 These results raise the question of whether method-based concentrations in social work simply respond to students’ interests or are inadvertently contributing to divisions among different types of social workers, says Melinda Lewis, LMSW, an instructor at the University of Kansas School of Social Welfare. Lewis created and administers a website called “Classroom to Capitol” that encourages discussion of the role community organizing, policy analysis, and advocacy play in social work. The CSWE tries to strike a balance between micro and macro practice in its requirements for accredited schools of social work, says Joyce White, PhD, MSW, a CSWE accreditation specialist. The organization does not force schools to offer specific concentrations but instead tasks them with building certain competencies in their students—competencies that reach across professional practice, social justice, and sound research. The CSWE considers field education its signature pedagogy because field is the one place where micro and macro work can be intertwined in real practice settings, White says. Even if there is not an intentional effort to separate case and cause in social work education, what can be done to combat some students’ perceptions that a separation exists? Lewis suggests infusing macro-level content into all courses, including ones focused on clinical practice. This does not mean trying to convert clinical students to macro practitioners, she says, but instead making clear the connections among policies, the social environment, and client circumstances. Since social work students often are so influenced by the practitioners they encounter while in school, it’s important that schools expose students to social workers who have embraced both case and cause as part of their professional lives, Reamer adds. “I would love to bring these folks into my classroom and have them become role models for students, to show them how they can marry case and cause,” he says. Faculty members also should serve as role models, says Nancy A. Humphreys, DSW, a professor of policy practice at the University of Connecticut School of Social Work and director of the Nancy A. Humphreys Institute for Political Social Work. The institute works to increase the role of social workers in political campaigns and empower social workers to use tools such as voter registration drives to get clients more engaged with the political process. Political and social forces again are influencing the push and pull between case and cause in the profession. There are signs that more social work students are interested in policy and advocacy issues, says Mimi Abramovitz, DSW, the Bertha Capen Reynolds Professor of Social Policy at Hunter College’s Silberman School of Social Work in New York. For example, there has been an increase in the number of students in Hunter College’s community organization concentration since President Obama’s election. And the Occupy Wall Street movement could have the same effect. Yet this movement toward social action is, as usual, on perilous ground. Continued pressure to cut government funding for social programs—and the results of this fall’s national and state elections—could have a chilling effect on social workers’ appetite for social action, Reamer says. But Lewis is optimistic that younger social workers’ understanding of the importance of advocacy and policy will not fade easily. She says she has been pleasantly surprised in recent months by the number of her clinical students who want to be engaged in political action. “That’s a sign that the next generation of social workers believes they should have it all, and they may help to reshape the discussion about case and cause,” Lewis says. Abramovitz, M. (1998). Social work and social reform: An arena of struggle. Social Work, 43(6), 512-526. The future roles of “case” and “cause” in social work will be heavily shaped by the attitudes and beliefs of today’s social work students. In January, three MSW students from the University of Kansas—Meagan Bennett, Mac Crawford, and Aimee Heyne—participated in e-mail interviews with Social Work Today (SWT) to discuss their appreciation of the importance of both micro- and macro-level practice in their careers. The following are excerpts from these interviews. SWT: How does your involvement in policy/macro work inform your practice as a clinician? Bennett: Through my current work as a targeted case manager at a community mental health center, I strive to advocate with and on behalf of my clients at an organizational, community, and state level. By being aware of various social policies and community services, I am better able to advocate and secure needed resources for my clients. Heyne: By sharing direct practice experience and expertise with social workers who practice in policy and advocacy and utilizing their talents and skills in policy making, we will find that policies are more effectively introduced, implemented, and practiced. SWT: Why do you think social workers should be aware of both clinical and macro practice? Bennett: Clinical social workers, through their direct practice with individuals, may become aware of previously undetected social issues that negatively impact clients … and it is not possible to fulfill the mission of social work, to combat social injustices and end societal oppression, without incorporating macro work into clinical practice. Crawford: Every social worker should be exposed to both clinical and macro practice to allow for a better understanding of just how much each influences the other. It is exceedingly important that every social worker in a clinical setting understand the importance of advocacy on a macro level, as this is how the decisions that affect their day-to-day practice are made. SWT: What can educational institutions do to try to get students to recognize both sides of the profession? Crawford: I think that the MSW program at the University of Kansas does an excellent job of exposing students to both sides of the issue by presenting both the practice and organization course (and) the policy and advocacy course in the same semester of their curriculum. This allows the students to gain experience in both fields early on in their training, and I have personally seen several students completely change their mind on which track to pursue. Heyne: I know that most institutions will have a policy course, but I think that often those courses simply scrape the surface of what policy is. Rather than simply focusing on current policies and discussing those in class, there needs to be an understanding of how policy is made, how policy is implemented and decided on, and whether or not policy is effective for our clients.